You can read the explanation below or watch the video. For us to work on your information we can do this by either working online connecting to your office network or a cloud based product like Xero, OR you can upload the data to our web server and we can download and import it into our accounting software. Most data will be on your server or in the cloud in a digital form. Any additional hardcopy data that a BOSS accountant or bookkeeper needs access to will need to be scanned and saved on your server or, in the case of a cloud system, uploaded to our web server. You email a form outlining the job you want done or if you prefer simply describe it to your BOSS staff over Skype. You can include information about the job such as a completion date and a budget in hours. The BOSS team simply do the work online and then email you a list of queries. You can email back answers or talk over Skype if you prefer. In fact, talking with your BOSS remote staff is just as easy as talking to anyone in your office. You can track the status of jobs online at any time because BOSS gives you access to our cloud based Work Flow Max system. The BOSS team then finishes the job and sends you an email to confirm the job is done. In this case any hardcopy files are scanned by you and uploaded to our web server. You would also export the client file from your bookkeeping, general ledger or tax software and upload that to our web server. You email a form outlining the job you want done or describe it to your BOSS staff over Skype. BOSS simply downloads your data into the appropriate software and gets busy working on the job. After the job is completed all working papers and software files are uploaded to the web server ready for you to download back into your system. We then email you to say the job is ready for you to review. For accounting firms, to make things even easier, whether working online or offline, some of our clients give us restricted permission to the ATO portal and even have us lodge tax returns for them. 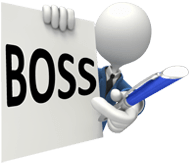 Remember BOSS is a Practice Entity Member of the Institute of Chartered Accountants in Australia and New Zealand (CAANZ) as well as an Australian Registered Tax Agent – so your work is in safe hands.